The Biblical name Moab refers to an area of land located on the eastern side of the Jordan River. Some historians believe the city in Utah came to use this name because of William Andrew Peirce, the first postmaster, believing that the biblical Moab and this part of Utah were both "the far country". 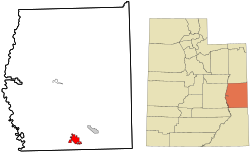 :16  However, others believe the name has Paiute origins, referring to the word moapa, meaning "mosquito". Some of the area's early residents attempted to change the city's name, because in the Christian Bible, Moabites are demeaned as incestuous and idolatrous. One petition in 1890 had 59 signatures and requested a name change to "Vina". :50 Another effort attempted to change the name to "Uvadalia". Both attempts failed. Moab's economy was originally based on agriculture, but gradually shifted to mining. Uranium and vanadium were discovered in the area in the 1910s and 1920s. [ citation needed] Potash and manganese came next, and then oil and gas were discovered. [ citation needed] In the 1950s Moab became the so-called "Uranium Capital of the World" after geologist Charles Steen found a rich deposit of uranium ore south of the city. This discovery coincided with the advent of the era of nuclear weapons and nuclear power in the United States, and Moab's boom years began. In 1949, Western movie director John Ford was persuaded to use the area for the movie Wagon Master. Ford had been using the area in Monument Valley around Mexican Hat, Utah, south of Moab, since he filmed Stagecoach there 10 years earlier in 1939. A local Moab rancher (George White) found Ford and persuaded him to come take a look at Moab. There have been numerous movies filmed in the area since then, using Arches National Park and Canyonlands National Park as backdrops. Since the 1970s, tourism has played an increasing role in the local economy. [ citation needed] Partly due to the John Ford movies, partly due to magazine articles, the area has become a favorite of photographers, rafters, hikers, rock climbers, and most recently mountain bikers. Moab is also an increasingly popular destination for four-wheelers as well as for BASE jumpers and those rigging highlining, who are allowed to practice their sport in the area. About 16 miles (26 km) south of Moab is the "Hole N' The Rock", a 5,000-square-foot (460 m2) 14-room home carved into a rock wall which National Geographic has ranked as one of the top 10 roadside attractions in the United States. Moab's population swells temporarily in the spring and summer months with the arrival of numerous people employed seasonally in the outdoor recreation and tourism industries. As of the census  of 2000,[ needs update] there were 4,779 people, 1,936 households, and 1,169 families residing in the city. The population density was 1,313.1 people per square mile (506.9/km²). There were 2,148 housing units at an average density of 590.2 per square mile (227.8/km²). The racial makeup of the city was 90.35% White, 5.46% Native American, 0.36% African American, 0.29% Asian, 0.08% Pacific Islander, 1.88% from other races, and 1.57% from two or more races. Hispanic or Latino of any race were 6.44% of the population. Prior to the construction of the railroad in 1883, Moab was a strategic place to cross the Colorado River. A toll ferry service across the river ended when a permanent bridge was built in 1911. This bridge was replaced with a new bridge in 1955, which was in turn replaced by another new bridge in 2010. The 1955 bridge was subsequently demolished. The highway that uses this bridge has been renumbered multiple times and is now numbered U.S. Route 191. Moab gained freight railroad access in 1962,[ citation needed] when a spur railroad line (now the Union Pacific Railroad's Cane Creek Subdivision) was built to serve the Cane Creek potash mine. Moab has never had passenger rail service, although the California Zephyr has advertised service to Moab in the past via stops at Thompson Springs (no longer a scheduled stop), Green River or Grand Junction, Colorado. In the 1995 film Canadian Bacon, Moab is one of the launch locations for American missiles on the Hacker Hellstorm. [ citation needed] The course for the pod races in Star Wars: Episode I – The Phantom Menace (1999) is a computer-generated imagery montage of Moab area landmarks, including Angel Arch. [ citation needed] The 2010 film 127 Hours, based on the true story of Aron Ralston, was shot in the vicinity of Moab.